If you are wandering through the woods at night and stumble upon something that looks like a carved stone stamped with the symbol of a snake—run! Maybe it’s nothing. Or maybe you have stumbled across the hidden grave of the long-dead Jako Emon. And that means that you are seconds away from an encounter with his wife, The Old Snake-Bone Woman called Jakotsu Baba. What is the Jakotsu Baba? With definitely one of the coolest names of all the yōkai, the Old Snake-Bone Woman’s kanji reads exactly that. 蛇 (ja; snake) + 骨 (kotsu; bone) +婆 (baba; old woman.) Depending on the region and dialect, she might also be known as Jagoba, the Five-Snake Woman: 蛇 ( ja; snake) + 五 (go; Five) + 婆 (baba; old woman). 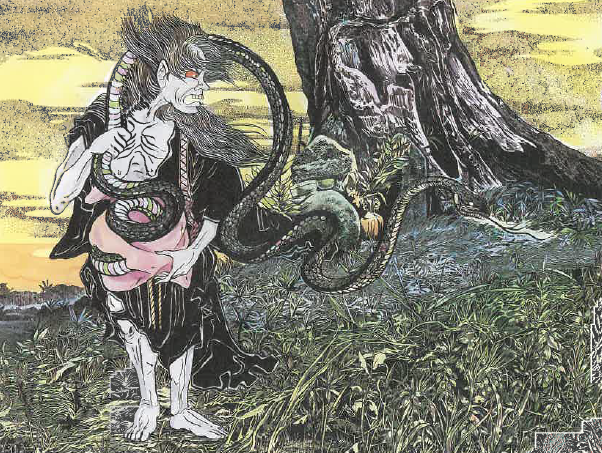 The Jakotsu Baba originally appeared in Toriyama Sekien’s Konjaku Hyakki Shui (今昔百鬼拾遺; Supplement to the Hundred Demons from the Present and Past). In the illustration she is drawn as an old woman with her body wrapped in snakes. Little is known about the Jakotsu Baba apart from what Toriyama wrote in his Konjaku Hyakki Shui. It is not known if he invented the character, or if he collected the legend from somewhere or someone. Jakotsu Baba does not appear in any prior collections, either in Japan or China. The other names mentioned by Toriyama—the Snake Family (云蛇塚) and the Old Snake-Bone Woman’s husband Jako Emon—have never been found in any other text, Japanese or Chinese. Nor has the snake-marked tomb been discovered. However, all of these peculiar and particular details give more flavor to the story than a typical Toriyama creation. It is also interesting that this yōkai lives in China. The setting of the story—Funkan-koku—is mentioned in the Chinese geographic encyclopedia Shan-hai Ching (山海経; Classic of Mountains and Seas). Supposedly, Funkan-koku is a region particularly touched by the supernatural, and renowned for its mediums and fortune tellers. It is possible Toriyama set his story here just to give her a more mysterious air. Yokai books from the Showa period expanded on the Jakotsu Baba and moved her mysterious grave to Japan. Showa period writers said that Jako Emon was a human, but when he died the sign of a snake was stamped onto his gravestone. To stand guard over his grave, his wife transformed into a yōkai, with a blue snake slithering into her right hand and a red snake into her left. She would attack anyone who came too close to her husband’s grave. Another unknown is the significance of the color of the two snakes, other than just to be freaky. The only colored snakes in Japanese folklore are white snakes, such as in the story The Tanuki and the White Snake. White snakes are considered sacred, and bring illness and death when accidentally killed. A yōkai figure with a similar name can be found in Minakata Kumagusu’s book Jyunishiko (十二支考; Twelve Signs of the Zodiac). 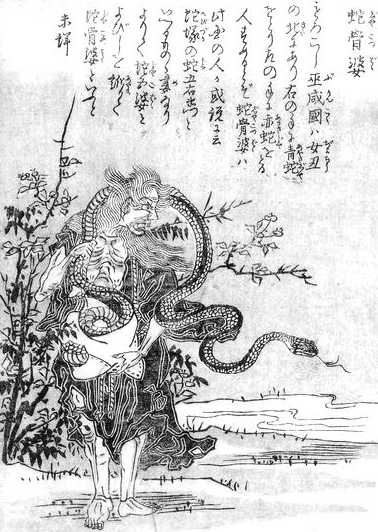 Jyunishiko tells the how local farmers use charms and incantations and invoke the name of Jajai Emon (蛇除伊右衛門; Snake-Repelling Stylish Emon) as a ward when bitten by poisonous snakes. The book doesn’t go into much detail, but the “Snake-Repelling” part of Emon’s name is obvious. The fact that he is “Stylish” (伊) is just a cool addition. Minakata says there are a few similar legends in Japan, which might account for a possible origin for the Jakotsu Baba and her Snake Family. However, this is just speculation. The name Jakotsu Baba has been used a few times, such as in a kabuki play by Konto Mizuki and in a few Edo period short stories. However, there is usually little attachment to the yōkai described by Toriyama Sekein. His Jakotsu Baba is both too vague and too specific, and thus does not appear often in Japanese folklore. This was a request by reader Dominique Lamssiesk. I had a short window in my busy schedule, and fortunately as a Toriyama Sekien yōkai there wasn’t too much to tell about the Jakotsu Baba. 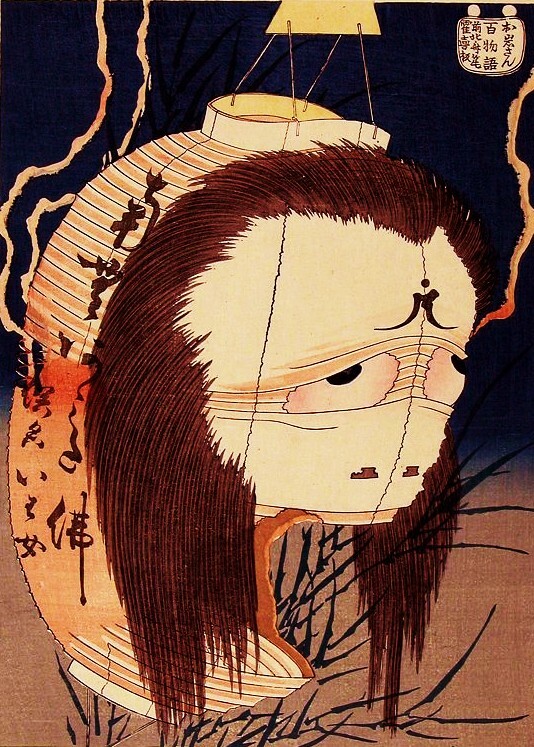 This is also a yōkai I didn’t know much about myself before researching it. I like the Voodoo vibe of these characters, especially Snake-Repelling Stylish Emon who I picture in a top hat looking something like a Japanese Baron Samedi. And of course the Old Snake-Bone Woman herself is a cool visual, keeping eternal watch over her husband’s grave. But for what reason and protecting him from whom? The stories never say—but I am sure an imaginative writer could fill in the details. Very cool! Thanks much! Though reading that she has such a cool backstory makes me disappointed in her portrayal in Ge-Ge-Ge-No-Kitarou and the Millenium Curse, but that was a Kitarou movie, so I shouldn’t have expected much. I’m still working through the back post blogs, so forgive me if you’ve already gone over this, but have you found that many of the youkai in Sekien’s work are claimed to come from China?